She dreamed a dream in time gone by. 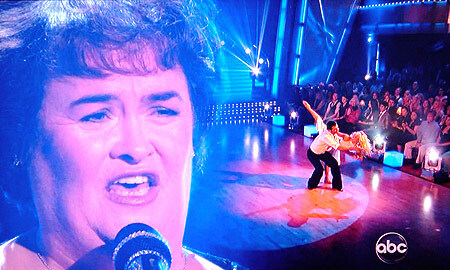 On this week’s Dancing with the Stars results show, Susan Boyle sang “I Dreamed a Dream”. What was especially strange was this shot, where her giant head loomed over the two dancers. It reminded me distinctly of one of Scott’s favorite YouTube videos, Telly Savalas doing a spoken-word rendition of Bread’s “If”. Scott loves that video so much, he did a comic strip mocking it. The whole thing has become terribly meta. Crayon is bad. Smeared crayon is worse. 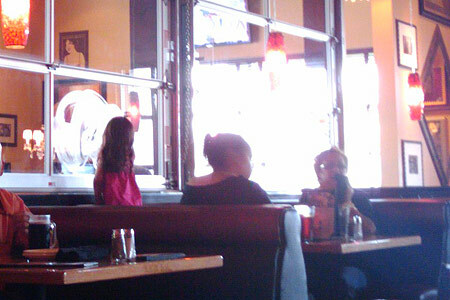 Next up is this example of fabulous “parenting” spotted at a local restaurant. This little girl drew all over the glass window with crayons. At no point did either adult tell her to stop. The servers didn’t tell her to stop either, but that’s not surprising; they probably have a policy about letting this kind of thing happen and cleaning it up later, so the customers don’t get irate at having their parenting skillz called into question. At this point of the meal, the little girl took a napkin soaked in water and smeared the crayon wax all over the window, making an even bigger mess. Last but not least, this is a menu that was shoved under our door by the good people at “NY Style Pizzeria”. 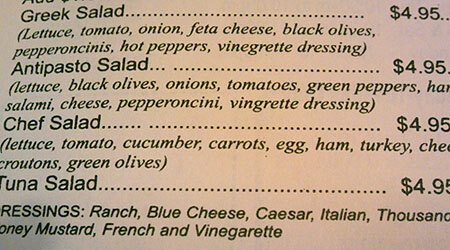 As you can see, they can’t decide how a vinaigrette is spelled, but they’re covering all of their bases. 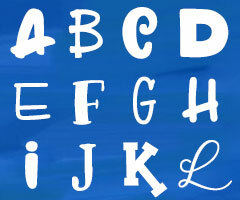 None of which is the correct base. By the way, did you know that a vinaigrette doesn’t need to contain vinegar? Any acid (like a citrus juice) will do. Dear NY Style Pizzeria: just call it “house Italian”. But be sure to capitalize “Italian”. 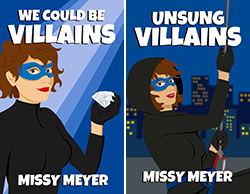 I’m sorry, Missy, but didn’t YOU call their parenting skilz into question? It’s probably a curse of mine and it’ll probably get me killed, but I’m sure I would have walked by their table, maybe while TAKING the photo, and loudly said to anyone who could hear me, what a shame it was that they probably wouldn’t get their security deposit back when they moved out because they had clearly allowed their child’s creativity to rule every environment they inhabit (or something equally snide and condescending). So do tell, what did YOU say? My tongue has gotten me into trouble before, so I’ve learned to pick my battles. If four servers and a manager of a restaurant pass by this scene and say absolutely nothing, then what difference would my comments make? Certainly the ladies would think I’m some sort of child-hating crank. You can frequently tell by the dewy, isn’t-that-adorable look in their eyes that no matter what the kid’s doing, it’s the cutest thing on earth, and they won’t listen to anything you may say. Now if the child were coloring on MY windows, that’d be a different situation. And when not at work, the thing I say the most to children is, “Stop that and go find your mom.” But when mom is right there gazing lovingly at the carnage? Pointless to argue. Yeah, I know, that’s why I said it’ll probably get me killed one day. Oh, well. Heh. Actually, the mother probably did not think it was the cutest thing. She probably hates her kid, hates the screaming, crying, kicking temper-tantrums which result whenever any limit is applied. Maybe she even sometimes tries to enforce inconsistent limits at home, with poor results because she doesn’t follow through with threats and simply resorts to screaming, which the kid can do better at anyway. But when in a public place, the mother is obviously well-trained to pretend to not notice what the kid is doing. It’s probably the closest thing to 20 minutes of peace she will have that day. And they wonder why I don’t want children. I like my soul in its uncrushed state.